The Piaggio Group reported a 12.1% decrease in net sales over the opening six months of 2013, the company’s worst first half showing since 2004. Net sales totaled 671.5 million euros (US$891.9 million) over the first six months, compared to 764.1 million euros reported in the same period of 2012. 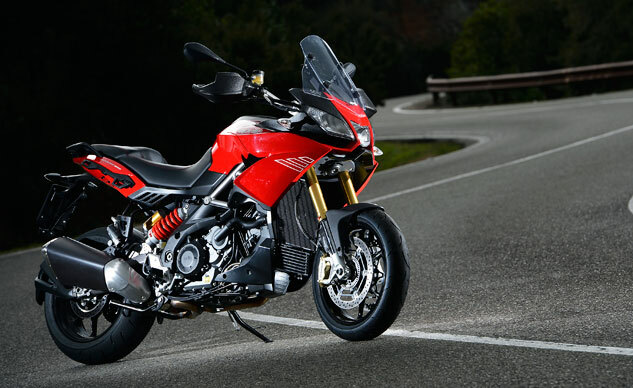 Piaggio still earned a net profit of 25 million euros (US$33.2 million ) in the first half, but that’s a 26.1% drop from last year’s 33.8 million euros. 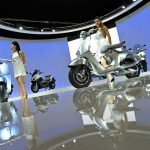 Over the first six months of 2013, Piaggio sold 201,900 motorcycles and scooters including vehicles under the Aprilia, Moto Guzzi and Vespa brands. This marks a 6.8% decline from 2012, when Piaggio sold 216,700 two-wheelers. Economic struggles contributed to slow sales in Europe though Piaggio says North American sales held up well over the first half. The biggest decline came in western markets (primarily Europe and North America) which took a 20.4% hit, dropping to 128,000 from 161,000 over the first half. Sales in Pacific Asia saw a smaller decline of 4.6% to 48,500 units from sales of 50,800 units reported last year. 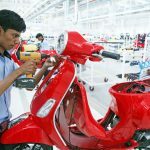 Piaggio’s sales would have been especially dire if it weren’t for the expansion of Vespa scooters into India, accounting for sales of 24,400 units. Looking closer at product breakdowns, Piaggio scooter sales took a bigger hit than its motorcycle sales. 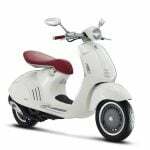 Piaggio reports 333.8 million euros in net sales from scooters, a 14.4% drop from 389.8 million euros in 2012. 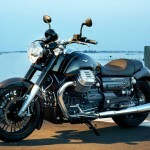 Motorcycle sales saw just a 0.6% decline in sales revenue, taking in 89.9 million euros compared to 90.4 million euros in the first half of 2012. 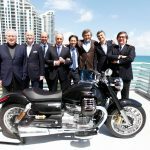 Moto Guzzi sales alone saw a 11.2% increase in sales while Aprilia sales were supported by the introduction of the Caponord 1200 in Europe. In light of its sales results, Piaggio says it will present a new five-year business plan by the end of the 2013, replacing its previous plan for the 2011-2014 period.